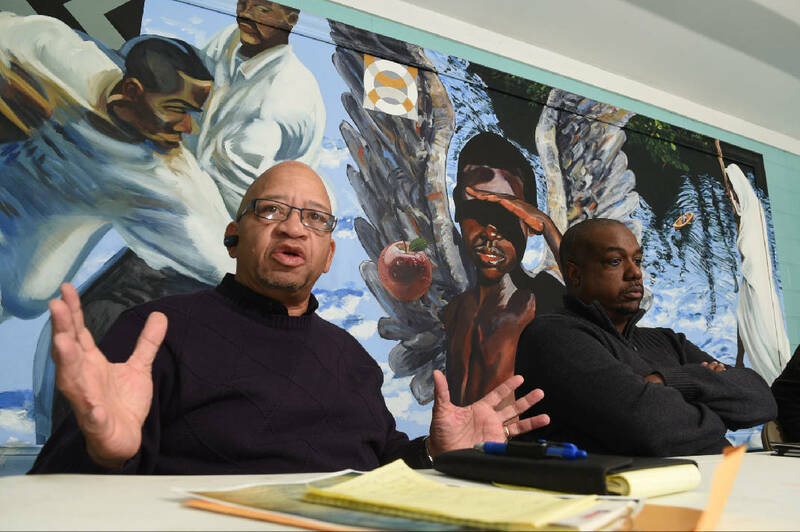 Pastors Ron Cook and E. Jonathan Thomas, from left, speak Wednesday at the Avondale Youth and Family Development Center in Chattanooga, Tenn., about plans for a series of Jan. 24 community prayer gatherings. The prayer events will be held in four community centers in an effort to address violence and other community problems. Local pastors are calling for the community to pray at the same time for the same purpose on Saturday. "We believe this to be a show of unity against homelessness, helplessness and hunger in our communities," said the Rev. Ron Cook, pastor of Rock Island Baptist Church. "We're going to deal with the various ills that have plagued us." The Rev. Jonathan Thomas, pastor of World Restoration Center; the Rev. Floyd Whiteside, pastor of New Mount Carmel Missionary Baptist; and the Rev. Bobby Hampton, pastor of Hawkinsville Missionary Baptist, all met at the Avondale Recreation Center with Cook on Wednesday to discuss the event. More than 30 pastors are committed to participating. At least two of them will be at each of 16 city of Chattanooga recreation centers at 11 a.m. Saturday to pray. It will be prayer for one hour, not a full church service, the pastors said. The goal is to have people from all over the city praying at recreation centers in their community on one accord. Everybody, regardless of race, religious denomination or economic background, is encouraged to attend. The prayer event comes on the heels of a weeklong celebration of civil rights leader the Rev. Martin Luther King Jr. during which several speakers highlighted violence and academic disparities among blacks and whites. The speakers challenged community leaders to act. Eleven people in Chattanooga were shot within the first 14 days of the year. Three died, and all of those people were black and under age 25. The youngest shooting victim was age 1. Seventeen-year-old Cortez Sims was charged with shooting the child. Sims is also charged with shooting three others, one of whom, 20-year-old Talitha Bowman, died. Tennessee has the 10th highest black homicide victimization rate in the nation, according to the Washington, D.C.-based Violence Policy Center. "There are some young men and women who feel like their voice is not being heard, and they are succumbing to violence," Hampton said. The ministers want to develop relationships with those youths and parents. The pastors are meeting in youth centers to be with young people and others regardless of whether they attend church or not. "No hidden agendas. Not seeking any type of fame or glory for ourselves," Hampton said. "We want better relationships with the community at large." Dozens of pastors started meeting in October after 20-year-old Apprentice Berry was shot at the Woodlawn Apartments, a housing site local law enforcement officials call a hot spot for shootings. Pastors said they don't know how to stop violence, but they're praying for divine wisdom. They're also praying that God touches the hearts of people committing the violence that they may stop. "We simply know that we are God's people and we've been called to prayer," Cook said. Contact staff writer Yolanda Putman atyputman@timesfreepress.com or 757-6431.